The hospitality sector has been complaining of growing staff shortages. BUSINESSES IN THE hospitality trade should be allowed to recruit asylum seekers to help plug skills gaps in the sector, according to an influential lobby group. Eoghan O’Mara Walsh, chief executive of the Irish Tourist Industry Confederation (Itic), has said the State should consider relaxing rules that prevent asylum seekers from working in food and tourism businesses. “There are lots of talented chefs, tour guides, people with hospitality skills who are currently not allowed work,” he said. Under temporary measures introduced in February, asylum seekers aren’t permitted to work here unless they have been issued a permit or given approval to register as self-employed. The measures followed a Supreme Court ruling that found a blanket ban on asylum seekers being able to obtain employment was unconstitutional. However applicants under the new scheme must secure a job with a starting salary of at least €30,000 per annum to qualify and they are unable to apply for positions in more than 60 sectors, including hospitality. TheJournal.ie reported this week that zero applications for employment permits from asylum seekers had been received by the Department of Business, Enterprise and Innovation in the last month. “Tourism has a problem: it can’t find enough qualified workers. If the qualified workers are within the refugee community, then we should give them every opportunity to earn a living,” O’Mara Walsh said. O’Mara Walsh was speaking to Fora at the launch of Itic’s eight-year national strategy earlier this week. The organisation set out 40 policy recommendations to help grow Ireland’s revenue from overseas visitors from €4.9 billion to €8.1 billion by 2025. Well-known restaurateur Sallyanne Clarke, who runs Dublin’s Michelin-star l’Ecrivain restaurant with her husband and celebrity chef, Derry, also raised the topic of recruiting asylum seekrs during a panel discussion at the Itic event. Clarke said she can’t understand why people “who are qualified and want to be out there earning their own living” are off-limits for employers. “I just don’t understand why the hospitality sector hasn’t been included,” she said. A similar view is shared by the Restaurants Association of Ireland, whose chief executive, Adrian Cummins, has been highly critical of the restrictions imposed by the Department of Justice. A number of panelists at the Itic event agreed that Irish hospitality is likely to face a talent crunch as it looks to grow from 8.9 million annual visitors to 13.7 million by 2025. During that same period, the industry is planning to add 80,000 workers to the existing 230,000 workforce. Itic noted in the policy document that the difficult of attracting talented staff is already “significant” given the fact that Ireland’s unemployment rate has fallen below 6%. Paul Carty, managing director of the Guinness Storehouse, said staffing is “going to be the biggest challenge” for the sector over the next decade. “We have a very transient workforce in hotels and restaurants and attractions,” he told the conference. Carty said tourism suffers from a “bad image” because it’s associated with long hours and seasonal work. As part of its 2025 strategy, Itic put forward a number of suggestions – including the relaxation of rules on hiring non-EU nationals - to help recruit and retain skilled staff in the sector. The organisation has suggested that a government-backed body take responsibility for the management of tourism education and training. “The fundamental thing is that there’s no one accountable State agency responsible for Irish tourism education and skills. We think that should be Fáilte Ireland. We think it’s part of their memorandum,” O’Mara Walsh said. 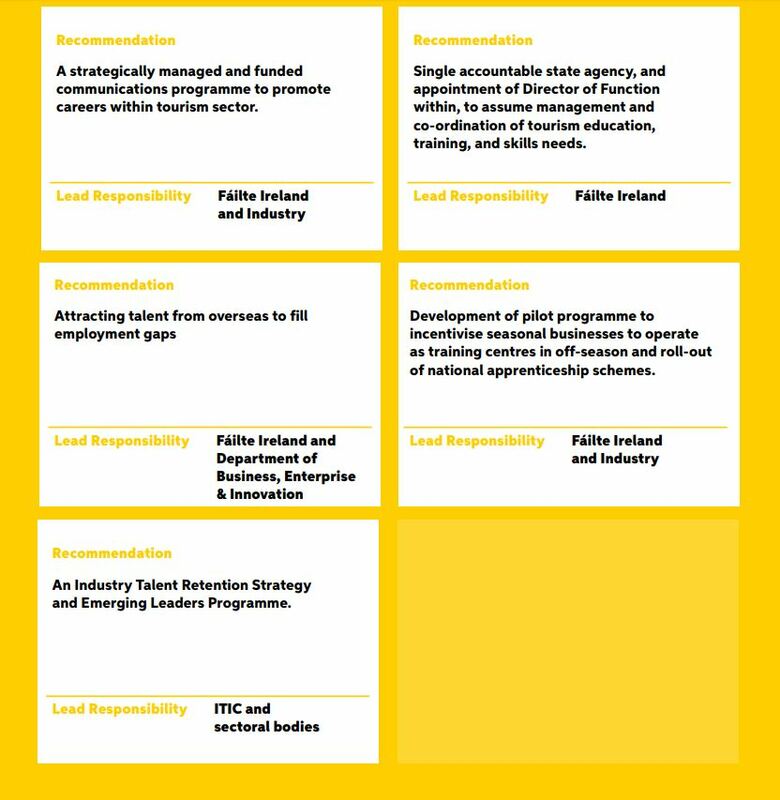 Itic – which counts Fáilte Ireland as an associate member – has called on the national tourism development agency to appoint a director to act as a liaison between the industry and the education system. It has also suggested the rollout of a communications programme to promote careers in the sector targeting second-level students and jobseekers in general. “This should be coordinated and funded by Fáilte Ireland,” Itic said in its policy document. In addition to promoting the industry, Itic has recommended that tourism businesses that only operate for certain months of the year should be “incentivised to open their kitchens and premises as training venues”. “This can be done through direct funding or a specific tax-relief for the business in question,” the organisation said.